Hey guys, I'm curious to know what you think of the just-revealed Lucina. She's very similar to Marth in both appearance and moveset, although according to a random stranger on the internet her dolphin slash is slightly different. She's also got her own page on the official site (here), and is listed as a newcomer, so it's unlikely that she's just a Marth reskin. So do you guys think she's a clone or what? Do you know anything about her from the games? She's a separate character but she's also a clone. Yeah, seems that way. How do you think she'll differ from Marth? Ike's got the "more power, less speed" thing covered. Funny thing, The "Lucina is an Alt" VS "Lucina is a seperate/clone character" is getting crazy lol. From what I see, I think Lucina is a Newcomer that is gonna work like an Alt. I know that sounds crazy. It's like, you can pick Marth. But as you scroll through the colors or something Lucina will eventually come up (like an Alt). Lucina will have her own sounds clips (voice, announcer etc.) so *Technically* that is a "New Character" as the site says, BUT she will play 100% like Marth. The reasons I think that? Her fighting stance in Awakening was very unique to her but she has Marth's stance here, and even that pose Marth does in Brawl she does it... Her Nair, Uair, Down/Side special look too much like Marth's too. So yeah... I dunno... It'll be the first time the series has done something like this (if this is the case). That's just my two cents. Of course we will find out soon enough. Hmm, interesting idea. IIRC, ZSS was considered a newcomer and given her own character page the last time around. So Lucina as an alt costume for Marth isn't off the table. Regardless, since you've played Awakening, Raigeki, what's her character like? Lucina is Chrom's daughter. And Chrom is a descendant of Marth. In the game Lucina and Chrom are pretty much the same stat wise. 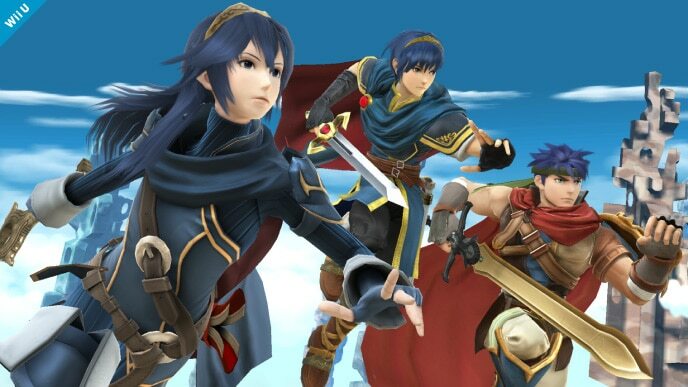 Lucina went by the name of "Marth" for the first part of the game to hide her identity. Oh~ Have any of you played Tekken? I guess what you can say is my guess is that Marth/Lucina is gonna be like Panda/Kuma. I'm not 100% exact on this, but the way they work is: One character slot, two characters, SAME EXACT moves/stats/properties/etc, but different intros/endings/sounds etc. But yeah regardless of anything, she seems like a really cool addition. OK, it is official. Lucina is NOT an alt or what I thought she was. She is in fact just a regular clone with her own roster slot and all that good stuff. So yeah... Now we know lol. Yeah, it's kind of weird that they decided to go that route, making her only slightly different. Do you guys think she'll be worse than Marth outright for competitive play? It seems like Lucina might be better for casual gamers because there's no sweetspotting necessary, but when you get to the level where you can hit with the tip fairly consistently, Marth seems like he'd be better overall. Like, correct me if I'm wrong, but I've been told that the reason Marth is much better than Roy in melee is because attacking from a slight distance makes more sense strategically, regardless of sweetspotting. If the tip of the sword and the fact Lucina is shorter (the two reasons sakurai said they are different) are the ONLY difference... Then I would say Marth will be better. Sweet Spotting his Dair was a spike which was pretty good. I'm still hoping there is more differences that he didn't mention.